Even with our "select" sampling of Southern California theater, 2010 had more than its share of successful new plays and musicals. Revivals we saw were less remarkable, but we still have much to celebrate. For world premieres the top honors go to Welcome to Arroyo's by Kristoffer Diaz, a production that introduced us to both a new play and a new writer. Though New York audiences already knew Diaz for The Elaborate Entrance of Chad Diety, that play would not make it here for another year, arriving the Geffen Playhouse in. Ironically, that play would not land as impressively for us as did this one, which subtly dug deeper into theater traditions to break from them and, in doing so, make a more emphatic call for understanding and change. On his own blog, Diaz called the play "hip-hop theater with a traditional narrative structure, a love song to the Lower East Side, and the single play that (even more than Chad Deity) explains who I am and why I am." For musicals there was the ambitious Venice at the Kirk Douglas Theatre. Pilloried by the critics, I still liked it, as narrative missteps were easily forgiven for the force and drive of the music, staging, and performances, led by Matt Sax, Erich Bergen and Angela Wildflower Polk. There were two Hershey Felder shows, celebrating the music of George Gershwin and Leonard Bernstein, staged, respectively, at the Laguna Playhouse and Geffen Playhouse, his two championing L.A. area venues. The top honors, however, go to the master, Stephen Sondhein, and an impressive production at Chance Theatre. On the subject of musicals, it should be noted that Open Fist Theatre gave us a good look at Tom Stoppard's Rock 'n' Roll, another brilliant work from the visionary Czech-born Englishman. In the acting areas, Annika Marks made an indelible mark in Wendy Graf's Behind the Gates, as the tormenting teen who leaves her unappreciated privilege for the confining orthodoxy of strict Judaism in Israel. Her opening monologue won raves and help launch her subsequent film and television career. Ed Harris, the biggest star seen all year by me, gets the 'mirror' not for his celebrity but for the masked delicacy of his portrayal of the twisted mourner in Neil LaBute's Wrecks at the Geffen Playhouse. Harris' performance, in which he takes advantage of the intimate Skirball theater to make constant eye contact with the audience, carefully leads us into a world of tender love and devotion that existed outside the limits of social taboo. 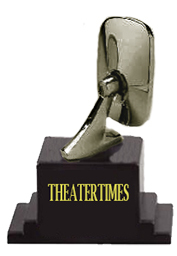 These personal citations of appreciation are intended to be made each January for the just-concluded year and are based the opinion of Theatertimes' lone critic. They may salute a landmark production that is seen as historic or simply note an individual achievement, even if it came in an otherwise forgettable production.